Do you know a woman who exemplifies excellence, who is an inspiration to others, or who is committed to creating positive change in our community? Nominate her to be honored at the YWCA’s Women in Leadership Luncheon on Thursday, May 9, 2019 from 11:30 am to 1:30 pm at the Aqua Turf Club in Plantsville. YWCA New Britain is now accepting nominations for women to be recognized at the 18th biennial Women in Leadership Luncheon. 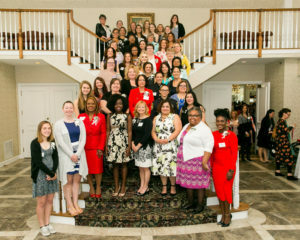 The luncheon celebrates and honors women and female students in central Connecticut. More than 600 women have been celebrated for their outstanding accomplishments and contributions in our community since 1985, and hundreds of their supporters attend each luncheon to show their appreciation for these phenomenal women. The nomination deadline is March 15. Women in Leadership honorees are selected by a committee of community leaders who review the nominations and make final selections. If a nominee has been chosen for recognition, she will be notified by April 1. Nomination criteria and forms can be found here.